The Nokia Lumia 1020 is first coming to the United States on July 26th, and you can start pre-ordering it tomorrow, but now you can also pre-order it fully unlocked with no carrier ties. Online retailer Negri Electronics has added the 41-megapixel camera superphone to its catalog and you can reserve yours now. The price for the Lumia 1020 is set at $735.50 and all three color versions (black, yellow and white) are available. The price is that high because it is not subsidized and in exchange you get to use the phone with no contract and on different compatible carriers. The Nokia Lumia 1020 offers a revolutionary camera that has a large ⅔” sensor, Xenon and LED flash, optical image stabilization and all of that packed into a relatively slim body. i thougt it was north of 100$? I'd rather wait for the Nokia EOS. Canon lenses on a phone would definitely be impressive. The Lumia 1020 is the Nokia EOS. Nokia will never put Canon lenses on a phone, because they have exclusive contract with ZEISS. Lol iphone is the most outdated phone! It's a cameraphone and i bet you wont find a 41MP camera for that price. Ummm, that price ain't producing 41 Mp pics. The phone doesn't take 41 Mp pics. The 'real' pic size is more like 12 Mp due to oversampling. It is producing both 38Mp and 5Mp pictures. Way higher than any other phone. Its too damn expensive..Agreed that the camera is awe-inspiring but if Nokia has to capture the market and be visible then they shouldnt have priced it so high.. This this this. Then wanting to make money is all well and good, but if they price it to high above people's budget, they simply won't sell. Every phone caters for a different public. 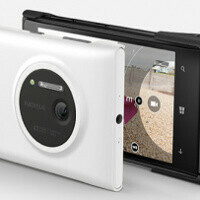 People who want a great cameraphone won't go and buy a Note 3, they will go for the Lumia 1020 or the Galaxy S4 Zoom. Anyway the specs on this phone are outstanding for Windows Phone and it will do everything you need and then some more. So you are Filipino ? Me too. I would rather have this phone than any other right now. I just don't like the robotic feel and look of android.. Sort of tacky looking like my space. Att shouldn't have this as a exclusive. Nokia should of put it on every carrier if they want too succeed in the u.s market. 249 2 yrs is too high should of put 199$ instead. Its actually $299 for a 2 year contract. L'il bit overpriced, i think this is because of MS.
Unlocked with AT&T?...dont work with other LTE carrier? This phone is revolutionary. Is Negri electronics a good retailer?